A 22 fret '80s retro shredder based on the old Kramer Pacer that was originally endorsed by the likes of Eddie Van Halen and Queensryche. The guitar has a licensed Floyd Rose trem, two hot Alnico V humbuckers, two volume controls, one tone control and a 3-way mini toggle selector. ■ Nut: R3 1 11/16 Locking nut, rear mounted. I have to say that this guitar gives my (3.5 times more expensive) Charvel USA production San Dimas a serious run for its money. The neck is amazing and I can't believe the overall feel and quality for the price. 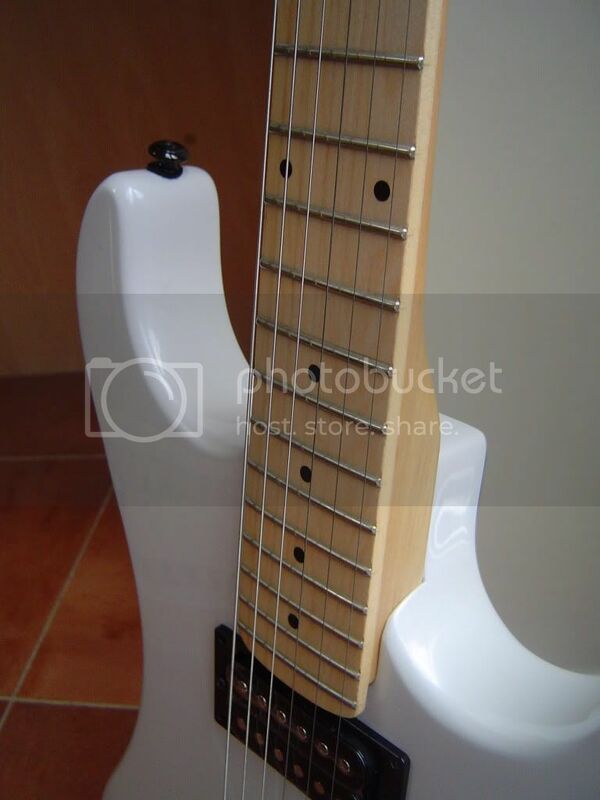 It really is not far behind the Charvel in terms of playability (especially), woods, fit and finish. It came well set up with good intonation, a parallel-to-body bridge (when I tuned up to concert pitch), lowish action with no buzz and just a touch of relief. The only marks were a few minor indentations on the fretboard edges on certain frets where I assume they've worked on finishing the fret ends (which are not at all rough.) 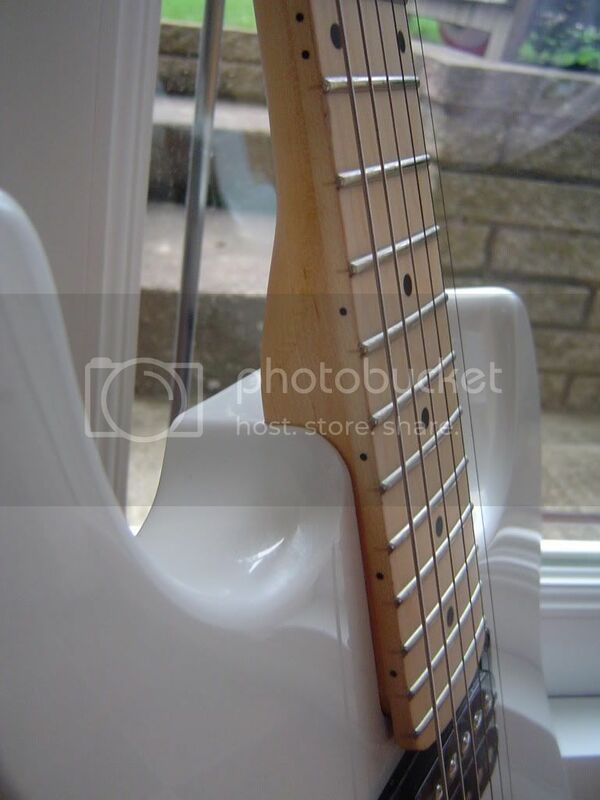 The frets appear well dressed and the pearlescent white paint job is smoothly and evenly applied. The pickups are listed as Kramer branded but they look a lot more expensive in their construction and component parts than I would expect on a guitar of this price. It's my suspicion that they could well be Gibson 90R and 91T pickups. They certainly sound good (see below.) This tremolo is a Kramer licensed version but its saddles are made of a seemingly identical grade of steel to that of the Korean OFR on my Charvel. It retains tuning stabilty superbly. In fact I hardly ever have to even fine tune it, although I'm not as viscious as I could be with trem antics. I have only one criticism of the FR and that is the presence of arm wobble. This is common with licensed Floyd Rose units and it even occurs with the Korean Original FR on my Charvel. I tried the white plumber's tape trick but this didn't cure the problem. Apparently you can also replace the arm with a German-made OFR version but I haven't been bothered enough by the wobble to get one. The guitar, being mahogany and maple, is actually quite heavy. However, the Pacer style body seems smaller and better ergonomically designed than that of a Strat so it's a very comfortable guitar to wear. Indeed, with a thick strap, its weight is not a problem at all. The only problem with this guitar's sound is its horrible stock strings. The Gibson/Kramer website states that it comes factory fitted with 10-46 gauge so I duly installed a set of regular slinkys. 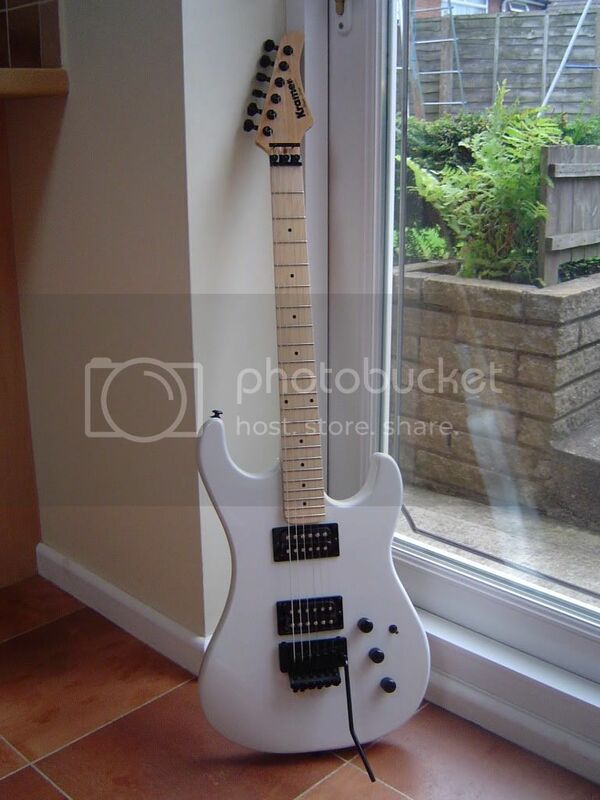 Unfortunately, this threw the trem in to a massive dive which, being a Floyd Rose, made it difficult to re-set up. Eventually I decided to switch back to 9-42 super slinkys and this brought the trem back almost level and it was then just a case of making minor tweaks to the internal claw screws to bring the guitar level. I have been told by a Kramer official that they sometimes put 9s on if they haven't got any 10s available. That inconsistency is a bit annoying on a guitar with a trem, in my opinion. Anyway once you've got some decent strings on, acoustically, the Pacer Classic has a very nice resonant tone. I think the trem springs actually add to the resonance and, coupled with the maple neck, they give a top-end bite to the darker tone of the mahogany body. Plugged in the bridge pickup yields a warm, mid rangy tone with a nice bright edge to it. Obviously, being a hot pickup it responds well to high gain from the amp but this is not compromised by any muddiness. With modest gain, the neck pickup gives a very nice bluesy tone that is more articulate and responsive; and on cleaner settings you can get a nice funky tone. 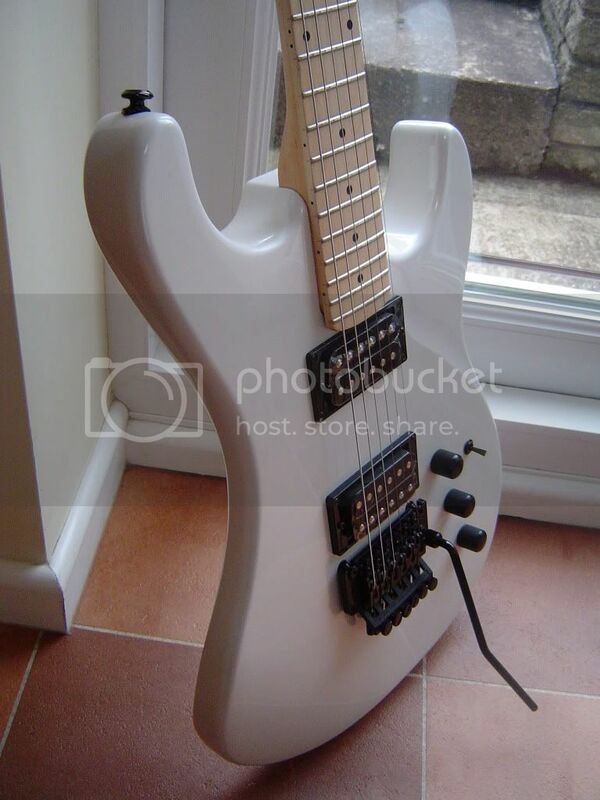 Overall, the pickups probably lack the grittiness/articulation (respectively) of my Charvel's JB/'59 set but they are neverthless warm, bright, clear and eminently usable. One criticism with the guitar's controls is a lack of range in the potentiometers. In fact, the volume knobs are virtually on/off switches. I gather that this problem is caused by the treble bleed modification and also that it can be rectified by changing the pots to linear taper (rather than getting rid of the mod.) Apparently Kramer are correcting this problem for the new 2011 models. During my first few weeks of owning the guitar a couple of minor issues emerged. Firstly, a loud mechanical buzzing noise eminated somewhere from the neck and body area. It turned out that this was caused by the screws that hold the nut in place at the rear of the neck (no, not the locking nuts) being loose. The solution was just a simple case of tightening up and the problem was cured immediately. On reflection, it probably isn't a bad idea for the nut to be a bit loose for shipping. The second problem I encountered was that the trem arm assembly started to come away from its internal plate. This required me to open up the rear access panel and tighten things up from both back and front using pliers. Again, once the problem was identified, it was an easy fix. The paint job on this guitar is very thick and tough. I look after my guits carefully but I would say that it would resist modest knocks with ease. After a year's ownership the Floyd has certainly stood upto the test of time so far, but if ever the knife edges started to go I could easily fit a replacement unit. I've played this guitar quite a lot since I bought it and I've not noticed any signs of fret wear which is a good sign. This guitar is a modders paradise. An original Floyd is apparently a straight, drop-in swap and I have also read that many people like to replace the trem block, the pickups and add a D-tuna device. I've also seen evidence on the web of custom paint jobs being done. In my opinion, however, the guitar is fine as it is. It looks great, sounds great and plays great! 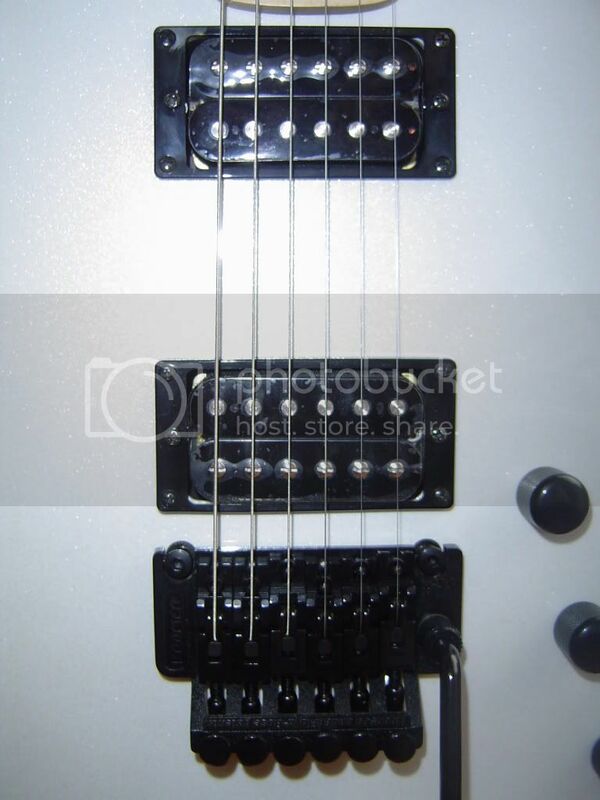 Personally, I would only replace the trem if I eventually needed to and I love the pickups as they are. 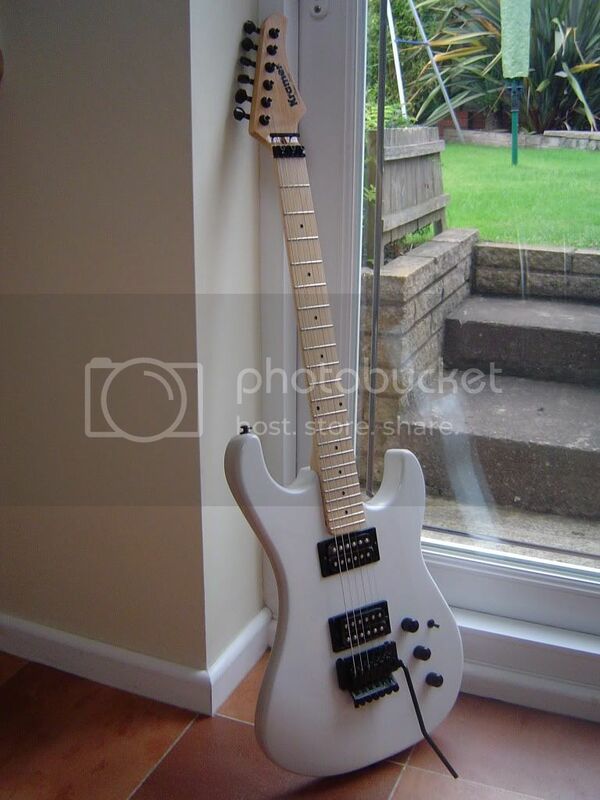 I was looking for a second retro shredder as a backup to my Charvel San Dimas. I'd never even played a Kramer before but I'd read good things about the 2010 Pacer Classic and I loved the look of them. Anyway, when I got the opportunity to try one I bought it without hesitation. 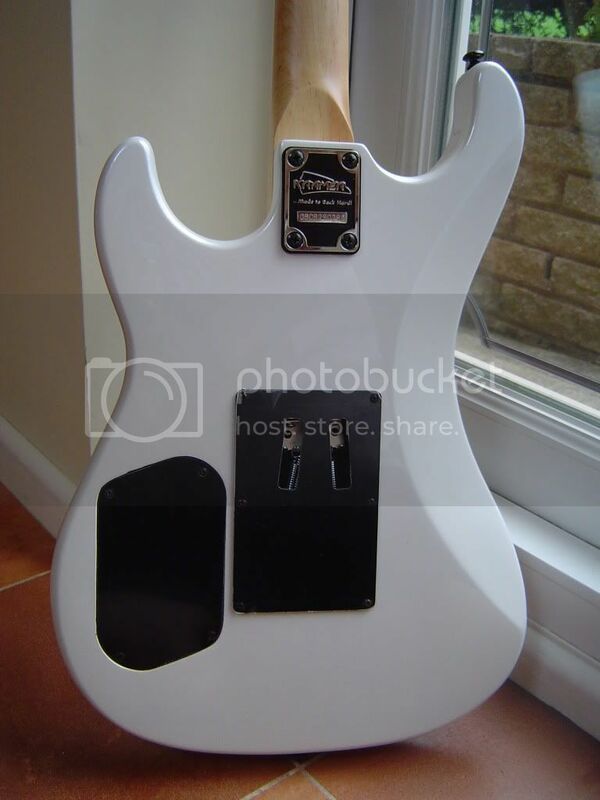 I would heartily recommend this guitar as a very good value, 'out of the box' shredder that can be modded by the more professionally minded player without worrying about throwing good money after bad. Great review Alan! Thank you very much! Hey, very nice review. I think these guitars are very cool and sound like a great deal for the price! 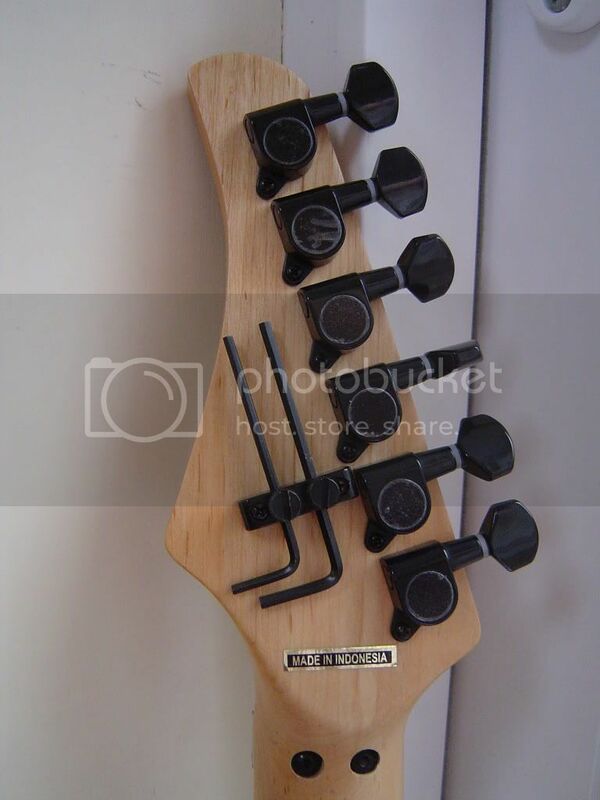 Interesting that it has a maple cap neck vs. a "skunk stripe". Were the originals that way? I don't remember since i haven't held one in probably 20 years. I wonder where these are made in Indonesia? Guitars coming from there seem to have very good quality woodwork nowadays. My Squier '51 and Vintage Modified Precision were both mad in Indonesia (I think by Cort). 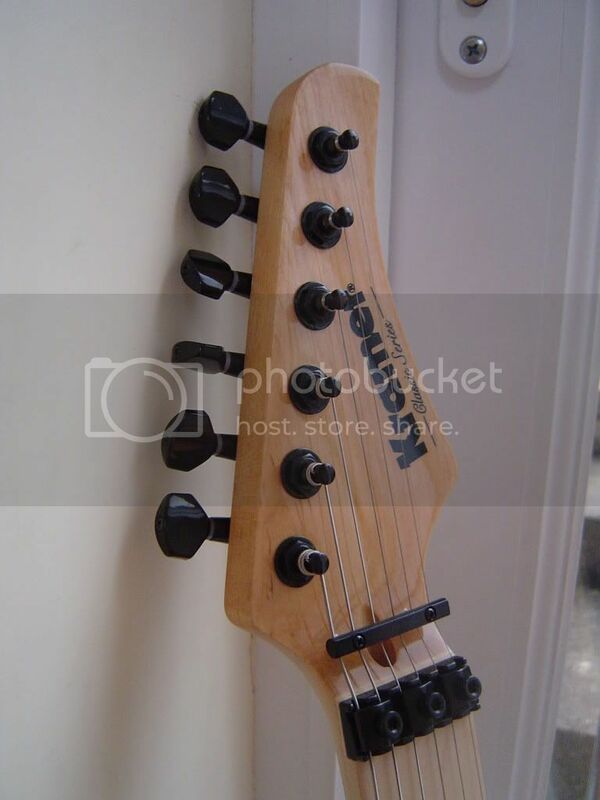 The Squier has very nice woodwork/fit/finish (though the hardward is cheap). The VM P-Bass is just darn nice all around. This guitar is now for sale. Hi there, I enjoyed the review very much. I was wondering if you could do me a big favour. 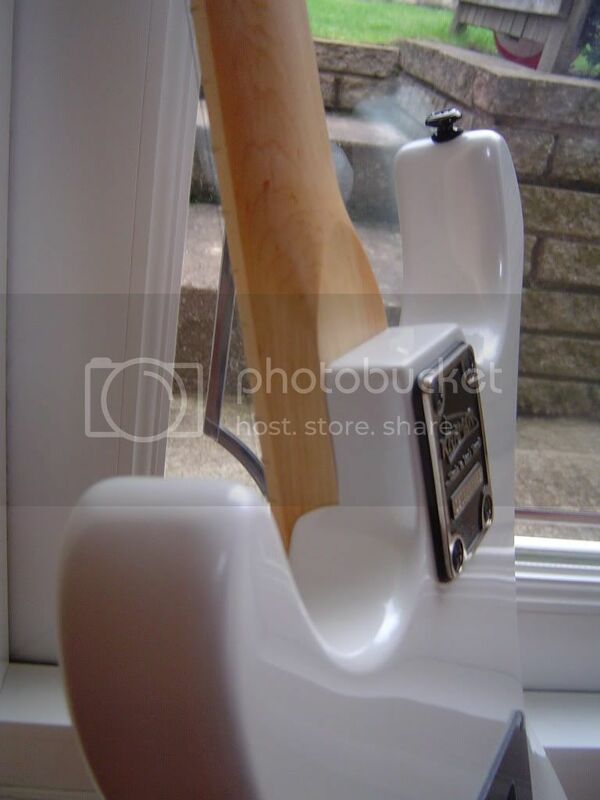 I need to know the distance between the tremelo and the humbucker (preferably in millimetres). I am trying to install a Roland Gr-55 pickup in between and my 86 Kramer stagemaster is too narrow between the Floyd and bridge so I'm thinking about buying the Pacer reissue.